Posting a bit late today. 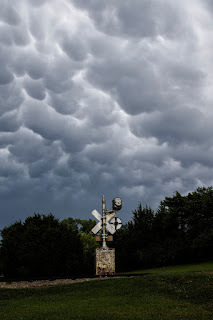 I was out playing trains until these clouds rolled in and brought some rain with them. These are Mammatas clouds and usually indicate severe weather but it was just a bit of thunder and lightning and some rain. I captured this Wig Wag signal with them as a backdrop.